Sadly I cannot make the weekend campaign scenario, but I'm hoping enough of us can get together for a small game tomorrow. Happy to produce a scenario if we can get an idea of numbers quickly. Have therefore set-up a doodle with a choice of times. It also allows you to express a preference for Napoleonic or ACW. I've put together an 1812 scenario which we can play today. More details later. You will need the Chancellorsville add-on, plus the 2 Nappy mods. That would be good Pepe. It would make at least 4 of us. As Josh cannot play before 20.00, I suggest we aim to start then. Meet on T/S just before if possible. It is 5pm on 25th July 1812. After administering a sharp defeat to Bagration at Trubetskoye, two days ago, the Emperor put Marshal Bessieres in charge of the pursuit. He has pressed the retreating Russians hard and there are signs of disorganisation, with stragglers and much equipment strewn along the road. But the Russian rearguard has so far prevented complete collapse, and the French have now outrun their supplies, and will have to give up the pursuit at nightfall in about 3 hours time. You must clearly use this last chance to destroy as much of the Russian army as you can. The Russian rearguard appears to be an all-arms force, with at least part of Dokthurov's Corps, and plenty of cavalry. Beyond that you have little information. 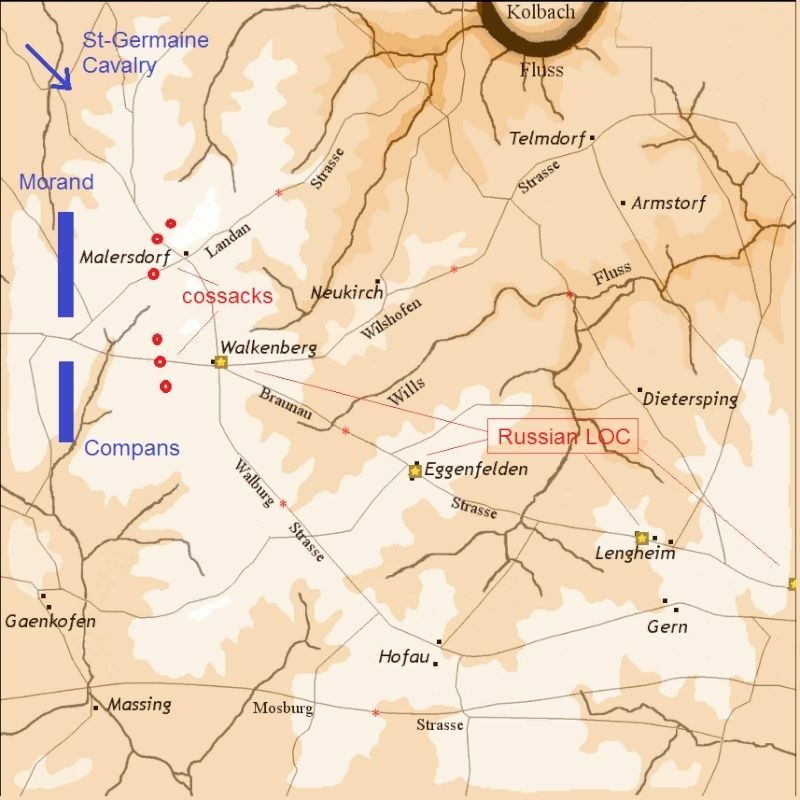 Your 3 divisions are approaching the villages of Malersdorf and Walkenberg, and report cossacks at both places. Thanks for sending me the replay Martin, I don't know the reason why both replay files (mine and the one from Digby) are not working and I get a game crash everytime I try to load them. What a pity as it is allways very interesting to get a general picture of the engagement. About not charging cavalry. The terrain I was fighting on was wooded except for one road running south, it has less trees but the ground was covered with leaves and troops got defensive bonus, so of course cavalry won't charge in woods. As usually I enjoyed my evening game with superb companions. Special mention to Josh who was CIC when eager to take the cavalry division. Glad you enjoyed it Pepe. Those Russians were tough hombres! Thank goodness they didn't commit the guard cavalry. Thank you Martin J, with the viewer I've been able to watch the replay. Lots of fresh russian cavalry awaiting for us. Nice cavalry ride you got at the very end, you ended up beside that russian battery in front of me. Well Martin didn't do me any favors. I had to watch my handsome brigade of légère being ridden down by all those Russian kirasirys. I hate cavalry.